At the end of last weekend’s race at New Hampshire, I was black flagged for jumping a restart, and the penalty cost me a shot at a win. Since then, a lot of people have asked me why I wasn’t angrier after the race, and the last thing I want people to think is that I didn’t care. I cared quite a bit. But a couple of things happened before the Sylvania 300 that had me thinking about the bigger picture, and they honestly helped put the result of the race into some perspective. Every time we go to Loudon, there’s a lady with her daughter — the daughter’s probably in her early 20s now, and she’s in a wheelchair. She’s always right at the gate when you walk into the garage to start practice, and for the last few years, every time I’ve seen her, I’ve said hello, signed an autograph for her, shaken her hand and gone about my day. This year, when I went to shake the daughter’s hand, the mom leaned in and whispered in my ear her daughter’s ailment was getting the best of her. She wasn’t able to really shake my hand anymore. That really stuck with me. Same goes for some news I’d gotten a few days earlier about a boy named Elijah Aschbrenner. I’d met Elijah at Catwalk for a Cause, a charity event held by Martin Truex Jr. He’s a 10 year-old boy suffering from cancer and, up until recently, his cancer had been in remission. I saw online recently that his cancer was back, and that the prognosis wasn’t good. 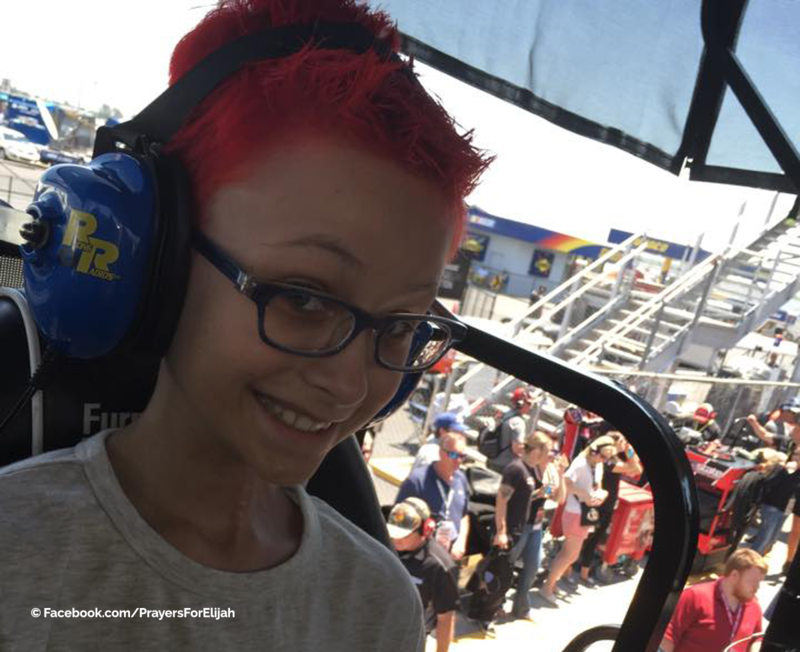 Elijah Aschbrenner was Martin Truex Jr.’s guest at the Talladega race earlier this year. All of these things made me want to take a step back, and talk about charity and giving back, and specifically, my own experience with it. The whole relationship that athletes and celebrities have with giving back is a complicated one. Sometimes you wonder about people’s motivations. What’s genuine? What’s being done for show because cameras are there? Does it matter? I’ll give you an example of the kinds of moral dilemmas that are out there. I heard of a very well-known football player who everyone recognized as being a great guy, and he really struggled with how to handle working with kids who were terminally ill. When he first started, he tried to keep up with the children. But when they passed away — which they all did — it broke his heart every time. Eventually, he decided to be very professional and great with the kids at the events he went to, but when they were over, he had to move on. It was hard to know what to think of that. When I walked into the hospital, it was overwhelming. There were people my age who were missing arms, legs, limbs and worse. I’ll never forget walking up to them, and seeing their bandages. So many of the bandages were this rust colored brown. Knowing that the bandages had been white to start with, and that they were changing to brown as the patient’s’ blood leaked into them and dried up — it made it so real to me. It also made me realize why it’s important to spend time with people in need. Spending time with some of the Paralyzed Veterans of America last year at Kentucky. You can give money to people all you want, but giving money and giving hope are two different things. We need them both, but understanding the difference between the two is really critical. That’s why I try to do more one-on-one meeting with people. When you’re with someone in an individual setting — or even if it’s a group setting — you’re helping someone momentarily escape their reality, escape their situation and perhaps, bring hope to them, which is a powerful thing. You can give them some peace of mind, and give them — and yourself — some perspective that they may not have been able to find. I usually start by talking the way I would with anyone I’m meeting for the first time, and keep it very focused on them: where they’re from, if they’re going to the race, that sort of thing. The one thing we don’t talk about, especially when I’m with servicemen and servicewomen, is their ailment. They get asked about it all the time, and typically, the last thing they want to talk about is how they were injured. That particular moment can bring back some really awful memories, and talking about it can also makes the person feel like he’s standing out in a negative way. So we talk, and hopefully, I encourage the person to keep up his or her own battle to survive, and continue to be an inspiration for others. One of other things I’ve noticed when I’m meeting face-to-face with people is that their families need encouragement, too. They’re trying to take care of this individual, and it’s so hard to take care of yourself, let alone someone else sometimes. Family members need some inspiration — something to prop them up — and I try to do what I can there, too. Finally, the other thing is that when you’re there in person, you can sometimes help spread the news about that person’s illness, and bring attention to their situation so that they and others like them can benefit from it. Tony Stewart is one of the most charitable men in our sport. I’m glad he’ll be sticking around after he retires. 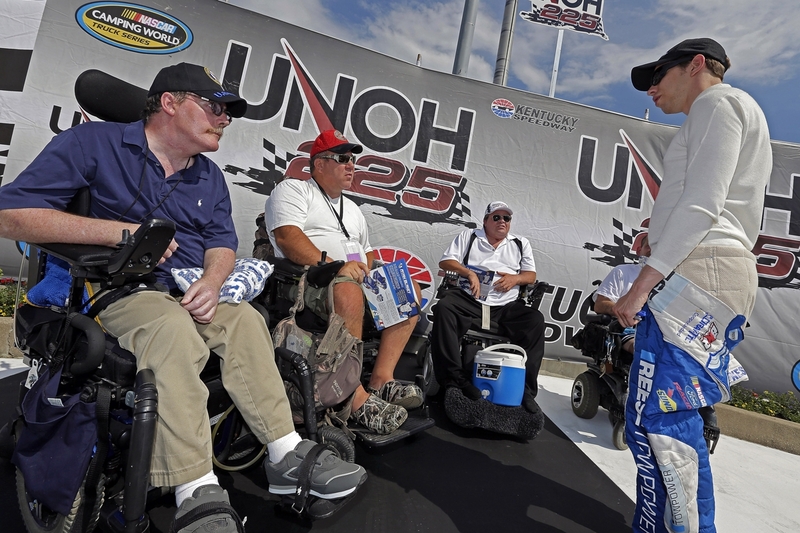 We have quite a few drivers in NASCAR who put in the time to help many, many people. 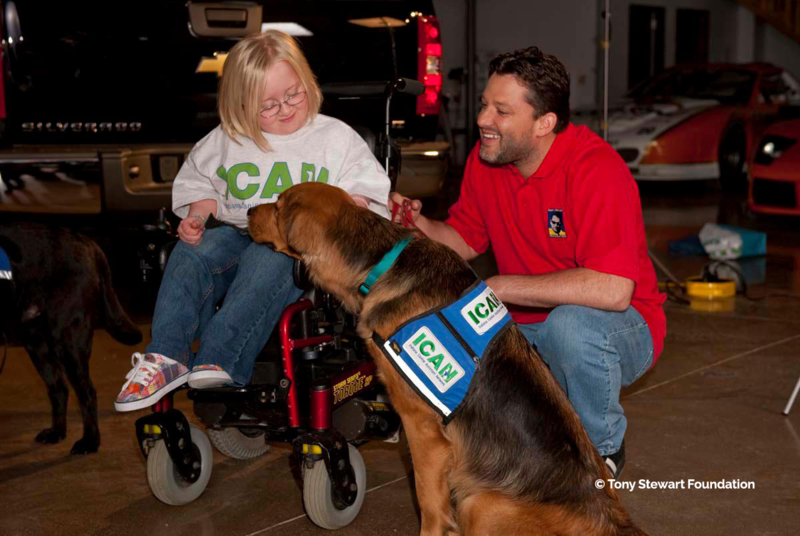 Given what happened this week, I want to take a moment to acknowledge Tony Stewart, arguably the most charitable person you’ll find in the garage. He does a ton, and you’d never hear about any of it because it’s all done under the radar. I have a tremendous respect for him because of that. There’s no doubt that being a parent — even as short a time as I’ve been a parent — affects the way you look at children. The hope is that one day, kids grow up and figure out the world on their own, making their own decisions for good or bad. The idea that they’ll never get that chance, that they’ll never get to walk their own path, feels criminal. Elijah Aschbrenner has had a tremendous effect on me and on my girlfriend, Paige. He inspired us, and reminded us of what is truly important. I’ve included more information about him below. This weekend, I’ll get back behind the wheel of the 2 car, and I’ll put my energy back into racing for a championship. Sometimes things will go our way, and sometimes they won’t, and without a doubt, I’ll let you know how I feel about it. But whatever happens, win or lose, I’m going to remember that there’s a lot more happening outside the track, and it really, really matters. My hope is that you’ll take a moment out of your day to think about the bigger picture, too. There is literally a world of people out there who need our help.